Have you ever found yourself in this type of situation? You are driving along on the road, minding your own business, doing the speed limit and listening to a little Tom Petty and the Heartbreakers, when all of the sudden, out of nowhere, a pebble or other small object hurls itself at your windshield and forms a very small crack. Of course it has; this is a common occurrence that happens every single day and you have suffered it at least once in your life, if not more. But since the crack is so small and isn’t affecting your vision in any way, you decide to ignore it for the time being. And as you well know, over time that tiny crack in your windshield will spread, and before you know it, it goes almost all the way across the windshield. 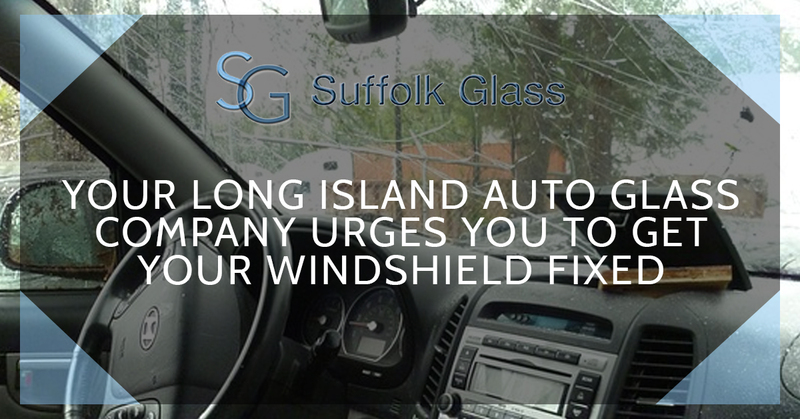 It is at this point that you will decide to have it fixed or replaced by Suffolk Glass, your auto glass company in Long Island. But waiting to have your windshield repaired is not a really good idea. You see, a small crack in your windshield can pose a number of problems. Here are a few things to consider when you get a small crack in your windshield. One of the functions of your windshield is to act like a support beam in the construction of your vehicle. Basically, your windshield helps support the roof of your car. Your windshield is designed to act as an aid in keeping your roof intact should your vehicle suffer a rollover. When that extra pressure during a rollover is added, it is critical that you have an uncracked windshield to prevent more damage. Today, airbags are safety features that we see in all cars and proper deployment of them could save your life. But your airbags depend on the windshield to deploy properly, as they use the windshield as a backstop to push forward into the passenger or driver. If your windshield has a crack, it might not have the structural integrity to perform this function. The force of an airbag being deployed might cause the windshield to break and deploy outside the car rather than towards you. According to research, the chances of you surviving a car crash decreases significantly if you are thrown from the car. And while wearing a seat belt is critical in keeping you inside your vehicle in the event of a crash, your backup defense is your windshield. Should you not be wearing your seat belt or if it fails, your windshield could be what keep you in your car and alive. However, a cracked windshield may not provide this critical service and could fail during an accident. This is just something to consider while driving down the road looking at your cracked windshield. So as you can clearly see, it is important that you get your windshield fixed right away even when the crack is very small. Contact Suffolk Glass for more details.